The Show-Me state sure knows how to keep its residents and visitors chugging along through the chill of winter. From immaculate performances of the legendary “Nutcracker,” to classic holiday light shows and beer festivals to warm you from the inside out, Missouri has it all. Here are the 15 best winter activities to participate in this season! The day after Thanksgiving marks a traditional celebration in the St. Louis area: it’s opening day for the Shaw Park Ice Rink in Old Town Clayton. From that day to the end of February, the ice rink, run by the City of Clayton as part of the extensive facilities in Shaw Park, has long hours, lessons, competitions, figure skating and hockey, all in a picturesque outdoor setting. For many Missouri families, Tchaikovsky’s “The Nutcracker” is as much a part of Christmas as decorated trees, Bing Crosby, and egg nog. All the major ballet companies in Missouri (Kansas City, St. Louis, Springfield, Columbia, and the Missouri Ballet) host annual productions, so there’s never one very far away. And the beloved story of Clara in the land of the Sugar Plum Fairy is accessible, even for those who aren’t sure they like ballet. It began well over a century ago, when a snowstorm hit St. Louis during the 1905 World’s Fair. Rather than be despondent over getting snowed out, attendees grabbed folding chairs and slid down the closest hill—Art Hill. 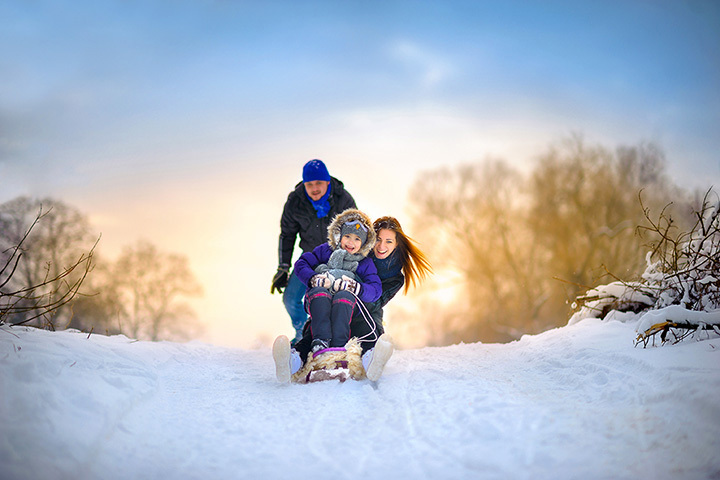 A tradition was born, and every year since, children and adults alike eagerly await a good Midwestern snowfall so they can take sleds, saucers, or sheets of cardboard and speed down the best sledding hill in St. Louis. Arguably the best way to prepare for the holidays is by watching Christmas movies…and where better to do that than at the annual Christmas Brew ‘n View at the Blue Note in Columbia? An annual tradition, the bar offers a different Christmas movie every year, various Christmas-themed drink specials, and complementary candy canes. Ticket are cheaper in advance, and can also be bought on the day. The transition from one year to the next occurs in many cultures during the quiet time of winter, and all of them have a celebration to mark it. The Nelson-Atkins Museum of Art invites you to celebrate the Chinese New Year with them. Music and dance presentations, crafts, performances, fashion, and, of course, art, are featured in this day-long yearly celebration. One of St. Louis’s favorite breweries invites you to belly up to the bar. The Schlafly Cabin Fever Beer Festival in mid-January bills itself as an afternoon of “big music, big beers, and big fun.” Unlimited three-ounce samples from over 40 Schlafly beers, and live music starting at noon, will cure your cabin fever and make you glad to feel well again. But don’t worry, if this festival doesn’t suit your schedule or taste, Schlafly holds a half a dozen other beer fests throughout the winter and spring. Cheers! For many, the magic of winter is found in the lights. Garden Glow, at the Missouri Botanical Gardens in St. Louis, features a million spectacular lights in a beautiful location, as well as traditional holiday music and delicious food. Come visit this winter wonderland, open nightly from 5-10 p.m.
With a total of six ski lifts, 11 trails, and a vertical drop of 299 feet, Snow Creek is the ideal place to spend a winter’s day. A resort perched high on the bluffs overlooking the Missouri River, Snow Creek has become a popular destination for skiers, snowboarders, and tubers alike. Who needs the Rockies? Winter fun can be had right here in the Heartland. After Christmas comes January, with its bitter cold. Fortunately, St. Louis has the Loop Ice Carnival to help you shake that off until spring. The weekend starts with the Snow Ball at the Moonrise Hotel, and is followed by ice sculpture contests, a Putt-Putt Pub Crawl, human dogsled races, and frozen turkey bowling. Top things off with some s’mores and a cup of hot chocolate, and you’ve found the cure for the post-Christmas blahs. The annual Plaza Lighting Ceremony on Thanksgiving night is the official kickoff for the holiday season in Kansas City. Attended by thousands of people, and broadcast live over area television and radio stations, the event is a beloved Kansas City tradition. The lights are truly spectacular, and shine daily from 5 p.m. to 3 a.m. through mid-January. The annual Winter Celebrations at the St. Louis Museum of Art offers a magnificent selection of seasonal art, music, and dance. Ensemble performances, decoration-making classes for the kids, hot cocoa happy hours, and lantern-lit strolls through the gardens all work to make this a holiday destination for families near and far. Be sure to attend this weekend of activities inspired by the warmth of the season. It’s cold out, but the Panic Film Fest is sure to get your blood pumping. Held in the historic Screenland Armour Theatre, the festival features 12-15 movies (all horror, thriller, and sci-fi). In addition to feature films, attendees can see a short film showcase, listen to podcasts, and attend Q&A sessions with visiting artists. Halloween may be past, but the long winter nights have terrors of their own. If winter’s here, that means Mardi Gras is around the corner. St. Louis plays host to a number of Mardi Gras activities between Twelfth Night and Fat Tuesday, but the best is in historic Soulard, the city’s oldest neighborhood and home to one of the largest Mardi Gras festivals outside New Orleans. Look for snowman softball tournaments, a family winter carnival, the beer, wine, and whiskey taste, and a lot more. You have to be 21 to enter, but in the dead of the early February winter, no place is as warm and cheerful as the Beer, Wine, Cheese, and Chocolate Festival in Springfield. Vendors and sponsors from the region’s finest restaurants, vintners, brewers, and chefs offer their best work in the art of creating some of humankind’s favorite food and drink. It includes classes on how to pair and prepare the featured items, live cooking demonstrations, and the debut of new products in each of the categories, and samples of everything are available for free and for purchase. For an additional ticket, you can also attend the Festival Dinner the night before, which is a fund raiser for the American Cancer Society. What better way to celebrate the holiday season than by a trip to the Ozarks for an Old-Time Christmas at Silver Dollar City? Featuring over five million lights, 1,000 decorated Christmas trees, two Broadway-style productions, and the Holly Jolly Christmas Parade, featuring Rudolph and all his friends, you'll take home beautiful Christmas memories destined to last a lifetime!